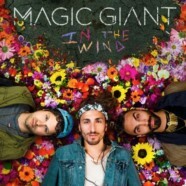 In anticipation of the May release of their debut album, In the Wind, LA-based alt-folk trio, Magic Giant, announced their In the Wind 2017 tour with shows in San Francisco, New York City, Washington DC and more! They will also be playing at various music festivals including Sun Drenched Music Festival, LaureLive Festival, Firefly Music Festival, RiSE Festival, and more. The band has released two songs from In The Wind, “Set On Fire” and “Jade.” In the Wind will be released on May 19 via Washington Square/Razor & Tie. The album was co-produced with Ben Allen (Walk the Moon, MIA, Gnarls Barkley, Animal Collective). To pre-order In the Wind – PRESS HERE, and PRESS HERE to pre-order the CD and merchandise bundle from Magic Giant’s website. To date, “Set on Fire,” has amassed over 4 million streams in less than one year, and reached #4 on Spotify’s US Viral 50. In the spring of 2016, Austin Bisnow (lead vocals), Zambricki Li (banjo, violin, harmonica), andZang (acoustic guitar, cello) welcomed nature into the fold as their unofficial fourth member. Magic Giant converted a shuttle bus into a solar-powered mobile recording studio and set out to record In the Wind. Inside a Redwood tree off the coast of California, within a tunnel by Snoqualmie Pass, on an airstrip in Marble, Colorado, and in a wild daisy field near Crested Butte are just a few of the places the trio recorded their debut. They ended their recording journey at their home studio “The Bunker,” in Silver Lake, Los Angeles. The instrumentation includes (get ready…) orchestral drums, banjo, trumpet, saxophone, harmonica, synthesizers, electric bass, cello, viola, violin, dobro, lap steel, mandolin, and more. The three band members found themselves serendipitously through social media, and when their virtuoso talents were combined, it created a sound that was incredibly vibrant and booming with life.